A MUST READ open letter for Manny Pacquiao that defends him from his bashers and the LGBT community. 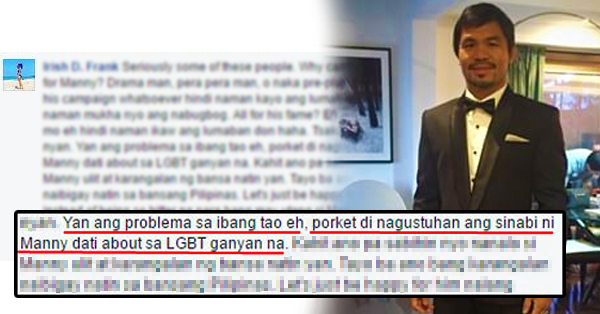 Home / News / A MUST READ open letter for Manny Pacquiao that defends him from his bashers and the LGBT community. A lot of people are rejoicing over Manny Pacquiao's win against Timothy Bradley. However, some people just couldn't help but to express their bitterness over Manny Pacquiao's win on his last fight. Some people are spreading rumors that this is already planned and that everything was scripted because it's Manny's last fight. Because of this, a netizen named Irish D. Frank was forced to explain her views about Manny Pacquiao's win. She claims that we should all just be happy for Manny's achievement in his fight and stop being bitter. She explained that we shouldn't hate him just because of the viral video about his views on the LGBT, instead, we should be proud that Manny has once again brought pride to our country.